It makes me happy when I see a popular food truck open a restaurant. Don't get me wrong, I love the whole experience of street food and gourmet food trucks. I've had my share of tracking them down on twitter and driving to their location so that I can enjoy a unique and delicious taco or grilled cheese, and all while standing around other "food-truckies" sharing the same moment. Ahh yes, those are good times, but so is visiting a place and having a chair and table to enjoy it. I tried Komodo last year when they first opened their Venice location. I was excited that their food (made famous by their trucks) was going to always be a short distance away from me. My favorite dish was the Kimchi Nachos with chicken, bacon, and sriracha aioli. I remember thinking, these are one of the best nachos I've ever had. I recently had the opportunity to visit again, and those nachos are just as good as I remember, probably even better. 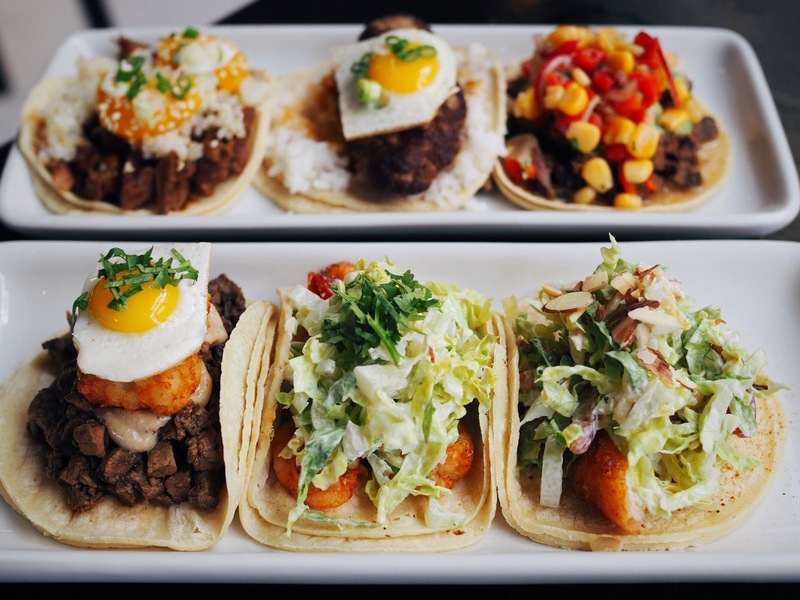 The tacos and burritos are always a solid choice, they are unique in the fact that they blend Asian and Latin influences with innovative flavors. However, on this trip I also discovered a few new favorites, like the miso marinated steak and the amazing mochiko fried chicken - a Hawaiian style chicken marinated in a homemade wet batter, fried, then oven baked. Komodo's slogan is "dangerously good food," and they're right! The food is good, dangerously good...especially those Kimchi Nachos. and MP3 (steak, tator tots, garlic aioli, cilantro). Tacos from left: Komodo 2.0 (steak, jalapeño aioli, corn salsa), Loko Modo (Hawaiian style seared ground beef, egg, pineapple teriyaki), and Asian Marinated Chicken (jalapeño stir-fried rice, mandarin oranges, and sweet soy sauce glaze). Kimchi Nachos: hot kimchi, bacon, chicken, green onions, sour cream, mozzarella, cheddar, jalapeños, and sriracha aioli. Order the Lychee Lemonade, you won't regret it.